NEW YORK — All three title fights for UFC 205 are official, but the card lost another bout after Kelvin Gastelum was unable to make weight for his matchup with Donald "Cowboy" Cerrone. Cerrone hit the scale first at 170.4 pounds for the welterweight bout, but then the veteran UFC fighter told FOX Sports that he was told Gastelum was not going to make weight. The New York State Athletic Commission will only allow a five-pound difference between opponents and apparently Gastelum was well over the weight limit. Ultimately, Gastelum released a message on Twitter apologizing for missing weight as his fight with Cerrone was cancelled. I will not be fighting @Cowboycerrone 2morrow on account that I couldn't make the wght limit. I apologize 2 cowboy ure a legend. God bless. I'm sorry to My team, my friends and the ppl that genuinely care for me. Extremely dissapointed I will have to reevaluate things in my life. Another situation unfolded early Friday morning when Thiago Alves stepped on the scale at 162.6 pounds for his lightweight debut. Because Alves weighed in first, his opponent Jim Miller was allowed to rehydrate before coming in at 157.6, which was within the five pound allowance. Alves was fined 20-percent of his purse for missing weight. Alves will not be allowed to weigh more than 173 pounds when he checks in for his fight on Saturday per an agreement made between the UFC and Miller’s team. It was a matter of unfortunate timing for Cerrone, who hit the scale ahead of his opponent, which meant Gastelum had to be within five pounds of his recorded weight — 170.4 — to allow the fight to move forward. Gastelum clearly knew he wasn’t going to get down to that weight allowance so he didn’t even step onto the scale. With "Cowboy" vs. Gastelum off, the UFC 205 main card will now move forward with five fights on pay-per-view. All of the other fighters on the card made weight without incident including the main event bout between lightweight champion Eddie Alvarez and featherweight king Conor McGregor. Alvarez was the first to step onto the scale, making weight at 154.6 pounds. 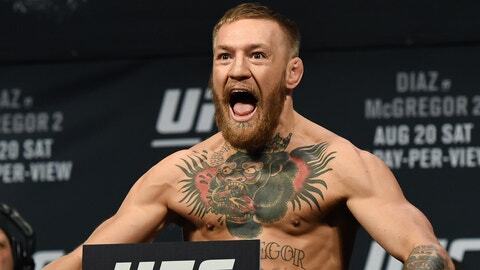 McGregor followed a few minutes later and hit 154.4 pounds for his first lightweight bout in the UFC as he looks to become the first ever simultaneous two division champion in the promotion’s history. There was no drama for either of the other title fights with Tyron Woodley and Stephen "Wonderboy" Thompson both coming in at championship weight while strawweight queen Joanna Jedrzejczyk and top contender Karolina Kowalkiewicz both weighed an identical 114.4 pounds. Ronaldo "Jacare" Souza was also on hands for the weigh-ins as an alternate just in case either Chris Weidman or Yoel Romero were unable to compete this weekend. Souza weighed in at 189 pounds and will be compensated for his time. Tim Kennedy (185.6) — Kennedy weighed in as an alternate after his bout with Rashad Evans was pulled from the card earlier this week. * Kelvin Gastelum was unable to make weight within five pounds of Donald Cerrone so the fight was cancelled.